The Devil’s Foot is among my favorites from the Granada series. 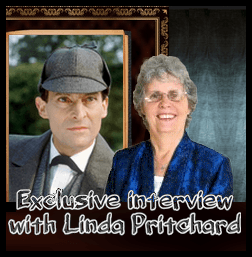 At the time of shooting Jeremy Brett’s mental and physical condition already began to deteriorate. In the episode you can see Holmes with short hair – because Jeremy got tired of the hairstyle of the detective and suddenly cut his hair off. (Though there are some illustrations of Sydney Paget, where Sherlock can be seen with short hair too.) The adventure is especially close to my heart in many ways. First of all, through this poison Hungary is mentioned in the adventure („save for one sample in a laboratory in Buda, there is no other specimen in Europe”). Second, the episode has interesting art references: in the hallucinations of Holmes you can notice two paintings of the famous artist and poet, William Blake: Nebuchadnezzar (1795) and The Body of Abel found by Adam and Eve (1825). Blake was a visionary poet and artist (painter, print maker and engraver). He lived in an age when rational thinking was dominant. The mathematical and other scientific inventions of Sir Isaac Newton signalled the advent of the age of enlightenment in Europe. These inventions verified the existence of general laws and the worth of scientific reasoning. There was such an enormous development in optics, chemistry and biology among many other branches of science, that made people believe more strongly in nature like in God. Many thought that rational thinking can help reveal the secrets of nature, and these can be used in turn to make their own life better and easier. The views of Blake were exactly the opposite. His opinion was that the driving force behind human nature is imagination, and not intelligence. He rebelled against the institution of art and created his own artistic style. He made illustrations for several apocalyptic scenes of the Bible. The picture was made in 1795. Blake wanted to pair the picture with the one that depicts Newton, the embodiment of rational thinking. The king is shown as a half-human, half-animal creature. He, who had been powerful one day, crawls on his hands and feet – as we can read in the Book of Daniel. Its author was a religious Jew, who lived at the time of king Antiochus Epiphanes – during his reign Jews were persecuted. The book was written in the first person. To encourage his fellows, the author tells six stories set in Babylon, before and after the Persian conquest. The stories show that those Jews, who were faithful to their religious habits, could beat their enemies with the help of God. The reminiscence of Nebuchadnezzar was still fresh at that time, because he repressed two Jewish riots and ordered the demolition of the church of Jerusalem in 586 B. C. He reigned between 605 B. C. and 562 B. C. in the Babilonian Empire as Nebuchadnezzar II. The city of Babylon lay on the bank of Euphrates river, located somewhere near Iraq. The kingdom of Juda, which could be found on the southern part of Palestine, fell a victim to the rivalry between the Babilonian Empire and Egypt. Nebuchadnezzar attacked and demolished Jerusalem and its temple between 587 and 586 B. C, and many citizens were deported to Babilon. This period was called the Babilonian Exile (586-539) – during these years many Jews got rich and some of them ceased to follow exactly the regulations of their laws. On the picture the king’s hair expands on his back, his long beard clogs under his body. His opened mouth, knitted brows and stare suggests helplessness. His robust and muscular body, which is depicted with profuse elaboration, disagrees with his unstable state of mind. Nebuchadnezzar gone mad, it is without doubt. The twisted trunks behind him refer to the huge tree he saw in his dream. 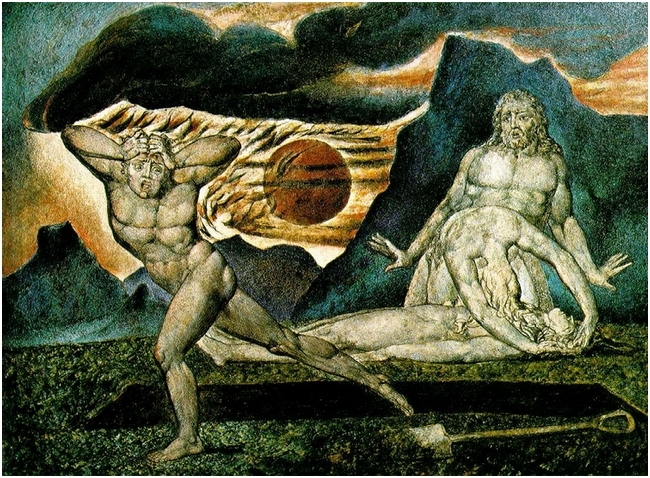 Blake’s picture can be related to the works of other romantic artists, who painted dramatic, sometimes apocalyptic visions, rebelling this way against the neoclassical style. But the special style of Nebuchadnezzar, particularly the thick outlines unmistakably show whose artwork is this. Though there is no authentic historical proof of the fact, it is a common belief that king Nebuchadnezzar may have suffered from a distemper called Insania Zoanthropia. Those who have this kind of illness behave like animals. Blake’s power of imagination is clearly seen in the picture, made in 1825. It represents the scene when Adam and Eve find the body of Abel, which Cain is going to bury. They kneel in horror beside the dead body. Adam is shocked, he stares at Cain, who runs away plucking his hair. Eve leans above the corpse with vast sadness. Her arms form a circle, while she is bowing, so her hair spreads above the body of her son. Though the pair’s gestures are false and awkward, they show their emotions impressively. The freshly burrowed, dark and long pit is further stressed by the shovel placed in line with it, separating the getaway son from his parents. Artists rarely chose this scene as their theme. We can find the story in the writings of Blake (dated in 1822), but it does not appear in the Bible. For him the ideas were more important than the realistic portrayal. His works purposely contradict the rational order of the 18th century. Blake drew the figure of Cain just to stir up the illusion of movement. His horror and sense of guilt is in the pose as he moves forward with his body twisting and stretching one of his legs behind him. He raises his arms to pluck his hair, his eyes are wide open, his mouth forms the O of horror. On the burning sky we can see the wrath of God. In Blake’s dramatic story entitled The Ghost of Abel, Satan and Abel’s ghost cry for revenge, while God and his angels insist on pardon. On the picture emotions are the most important. You can immediately feel the loss of Adam and Eve, and it is only enhanced by Cain’s realization of what he had done. His remorse is reflected by the dull colours and the background, which suggests that we witness a solar eclipse. There is a good reason why exactly these pictures illustrate the hallucination of Holmes. 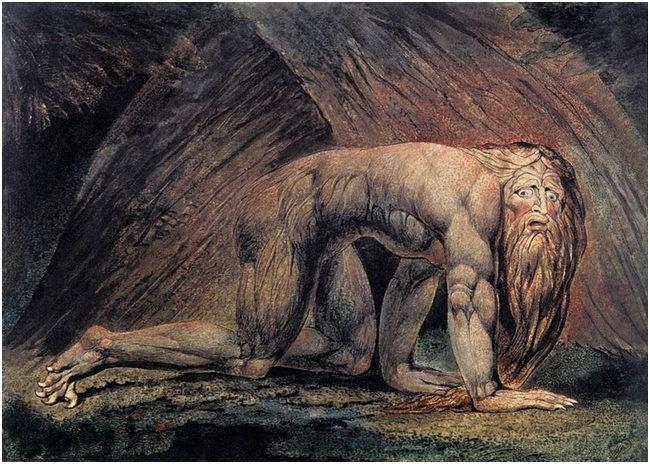 Nebuchadnezzar helps demonstrate the state of mind into which the poisonous powder drives its victims – people turn into animals. The other picture refers to sibling rivalry and revenge. In the adventure the deadly root is the instrument of revenge. The Devil’s Foot is a very suggestive and grim story. In it Holmes again lets go a criminal, a murderer – because dr. Sterndale killed a man, even if he did it to avenge the death of his love. This way at the end of the story there is a catharsis – a serious tragedy had occured, but the wrongdoer paid the penalty. While the released lion hunter carries the weight of his deed, and hopefully his soul finds solace one day.
" The Devil’s Foot and William Blake "